The ‘hi’ is the Japanese name for the groove (also known as a fuller) that runs up the length of the blade. 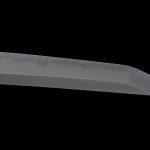 Its original purpose was to make the sword lighter and more resistant to bending. As time went on, decorative factors as well as practical ones were added as sword-smithing developed. It is often erroneously thought of as a gutter for blood, but this is false. 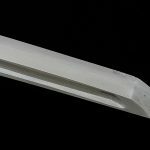 Outside of the weight and integrity of a blade the hi’s width and depth reflect what school the sword comes from. 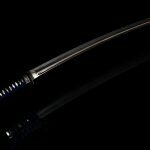 For example, many of the wide hi grooves were from the Miike school of Chikugo (Fukuoka) and the Mitsutada school of Bizen (Okayama), whereas the narrow ones are seen largely in the Soshu (Kanagawa) swords. 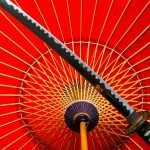 The shallow groove (also called sara-hi or “plate groove”) are seen in the Raikunitsugu swords from Yamashiro (Kyoto), but is also found in Miike swords and is considered typical of swords made by Miike Tenta. 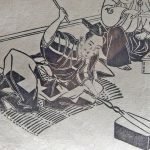 In this article we will explore the different types of hi and what schools and parts of Japan they came from. The bo-hi is the most common form of hi and when someone simply says “hi” they often mean “bo-hi”. 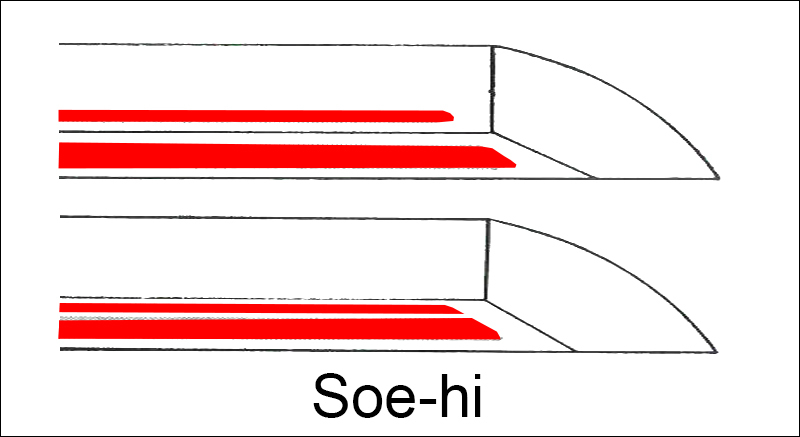 The shinogichi (ridge-line) is carved in a straight line, but there are actually two types: one where the ridge-line is still left on the ridge (shinogi) area, and another where the ridge-lines are left on both sides of the blade. There is also a style where two lines are carved alongside each other on the ridge line. This is called a nisuji-hi and is seen mainly in the Kamakura era, especially in the work of Teiso of Sagami (Kanagawa). There is also a style with three carved lines, though these are very rare. Sometimes, along the bouhi, there is an additional line that is not the same size, but thinner. This is called a soehi. Sometimes the soehi extends to the ridge area and moves over the top of the bouhi. This is called renhi and is found largely among the Bizen (Okayama) swords. The top of the futasuji-hi (double grooves) join, making it look like the shape of an iris. This is seen in swords by Kunimitsu and Norikuni of the Raiha school, and mainly in the Miike school from Chikugo (Fukuoka) or Akihiro from Sagami (Kanagawa). Sometimes one of the iris hi is cut off half way, and this is called “kuichigai-hi” (divergent groove). In this type the bo-hi is carved shortly to the waist area. 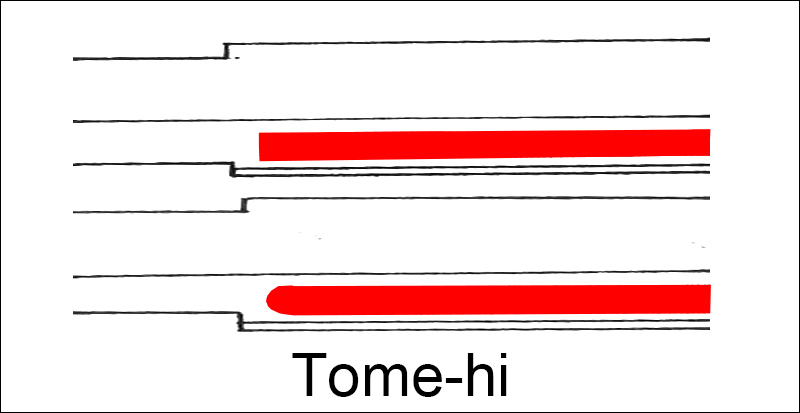 After the bo-hi, it has the longest history as a type of Hi groove. The koshi-hi is said to represent the Ragaraja, the god of love (Aizen-myo’o). 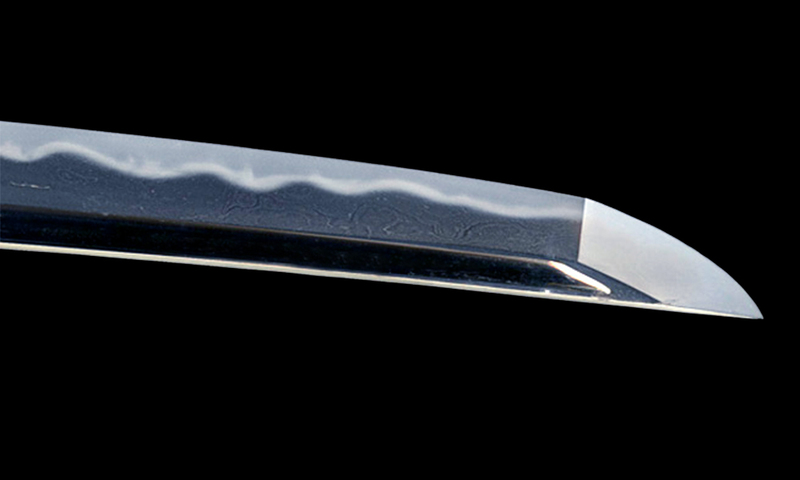 As its name suggests, it is seen a lot in nagainata, but also in blades made in the “unokubi” (cormorant neck) style. The hi extends to the tang of the sword instead of stopping at the baseboard. The hi stops halfway at the tang. If the hi extends toward the end of the tang, it is called “kakitoshi-hi” (carved-through Hi groove). If the shape of tome-hi is square, it is called kaku-tome and if it is round it is called maru-tome. The square one is seen in the old Bizen (Okayama) swords by Tomonari and the Bizen swords in the mid Kamakura era. In most eras it is seen in the older swords. The round ones are seen in the post-mid Kamakura era swords from Bizen, and throughout the Muromachi era. In the new era swords, the round clasps are seen predominantly. 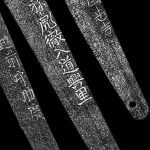 The hi is not simply a gutter carved into the blade, but also reveals the characteristics of the era and school of sword-smithing from which it was made..